constitutive promoter family member For video explanation on this promoter family and its use, see this. UTRrpsT enhances protein expression by structure at the 5’UTR. The enhancement of UTRrpsT may be related to its secondary structure, as shown by the website (http://rna.tbi.univie.ac.at/). Manchester 2017 used this part to create part MediumPromoter_PduD(1-20)_mCherry (BBa_K2213007). This promoter was combined with PduD(1-20) to create a tag with medium expression levels. 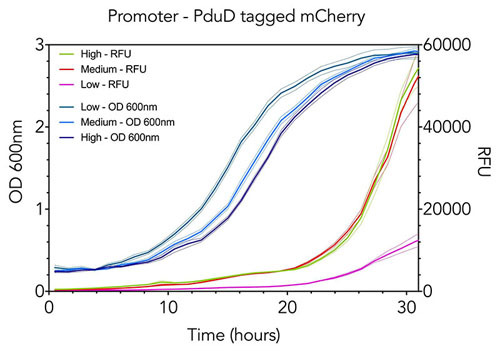 The mCherry tagged PduD(1-20) localisation tag displayed higher fluorescence levels under the medium promoter as compared to under low strength (BBa_K2213006) promoter, and similar fluorescence levels to the high strength (BBa_K2213008) promoter. This result was unexpected and should be taken into consideration when choosing promoters.